Hallways can potentially be one of the darkest areas in our homes, which can present a challenge because we all want to make a good first impression to our guests, don't we? This is the reason why I have chosen today's image, it works on so many levels and we can use it as a template on how to get it right by following some simple design rules. Together, let's make an entrance! In terms of colour choice, white is at the top of the list for maximising light levels in any room becuase it reflects the available light and creates the illusion of a larger more open space. If you are worried about brilliant whites looking too bright, you could go a shade or too darker with something like Farrow & Ball's Wimborne White, which will add a very subtle warm tone. Look how the white walls, ceiling and stairs in our image opens up the space and bounces the available light in every direction. Sticking with the theme of reflection and light, mirrors not only look great because there is a style to suit everyone, they also reflect light and create a sense of depth. Larger mirrors can even create the illusion of doubling the size of a room. To be on trend, opt for a rounded mirror in 2014. Our choice of flooring is of uber-importance when it comes to hallways as this design element normally has to cope with heavy duty foot-fall. For those of us who step straight into our hallways from the outdoors, lighter carpets aren't always a wise choice. However, these smaller decorative floor tiles inject some welcome colour, pattern and interest to the scheme and will be fairly easy to clean. Smaller patterns such as this can make a floorspace look larger than it actually is (as opposed to larger patterns). Notice also how the symmetrical lines of the tile design draws the eye through the corridor and into the main living space. I also love how the potted plants connect with the green diamond pattern and help to pull the scheme together. 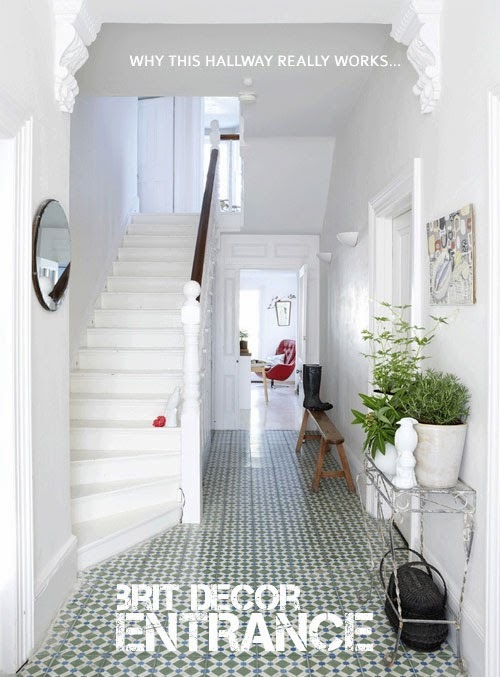 Hallways, like this example, tend to be on the narrow side - affording limited space for furniture. However, they generally require some storage for items like coats and shoes. The solution is to source some clever narrow storage like the vintage ironwork stand and slim wooden bench, above, which prove that practical can be stylish too! Finally, lighting - the wall mounted up-lighters here will transform what would be a very dark ceiling due to the limited natural light. Again, as with the furniture scenario, wall lights are often a great way of adorning your walls without taking up too much precious space.